First off, let me apologize for the terrible quality of these photos. I was running late and in a rush, and it was already starting to get dark. Shame on me. But anyway, my friend Amanda threw a party for Cinco De Mayo, which was named Cinco De Huss. The theme of the party was.. You guessed it, hussy! So I hussed it up with this fringed tube top which I absolutely adore (I had to wear the jacket while leaving the house so I wouldn't have to deal with getting scolded by my mother for wearing such a top, hah). 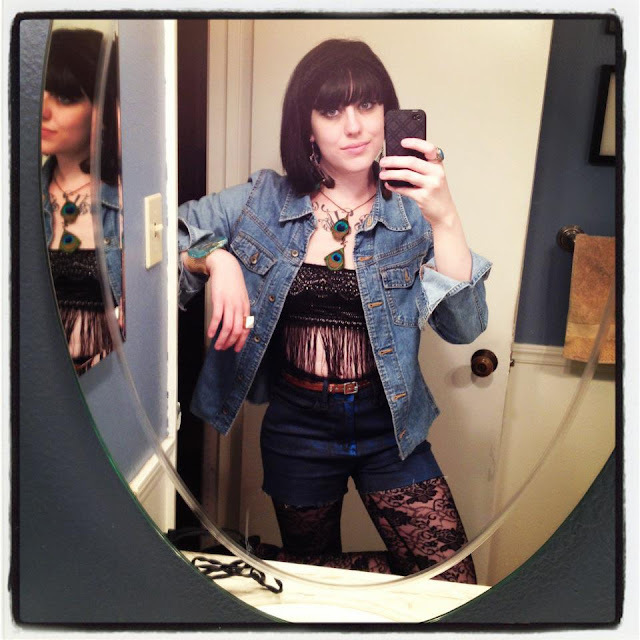 I totally turned this look sort of hippie-ish when I added the lace bell bottoms underneath these high waisted shorts. I was labeled the "most trendy" person at the party. Also, thanks to LuvB for gifting me this lovely black turband! Yes, I know it's hard to see because of my already black hair.. But I love it anyway! great outfit...your look is beautiful and original! This look is wild and I love it! i love that lace fringe tube top! looks great with hight waist shorts!